When Vampirella was first published by Warren Publishing in 1969, she was an inhabitant of the planet Drakulon, a world where people's physiology required that they drink blood (as we do water) - the rivers and seas were full of blood, and it rained blood. Drakulon orbited round twin suns, Satyr and Circe. Drakulon's sun Satyr erupted at irregular intervals to scorch the surface of the planet, destroying all living things. Then, as the sun returns to it's normal state, so a new life and new civilisation begins anew. Vampirella was of the Vampiri race, who are able to transform themselves into bats, sprout wings to fly and drank blood as our equivalent to water. Slowly but surely, the inhabitants of Drakulon were being destroyed by Satyr's latest eruption. As the last of the Vampiri struggled for existence a spaceship from Earth (the "Arthur C. Clarke") crash landed on Drakulon. Vampirella investigated, approaching in her bat form. The disorientated spacemen attacked her, and when she she retaliated she found they carried blood in their veins. After feasting, she managed to pilot the ship back to Earth where her adventures began. Weak and injured, Vampirella is rescued by Dr. Tyler Westron and taken to his clinic where he discovers her alien origins - and has to amputate her wings to save her life. While Vampirella recovers, the corpse of one of the airliner passengers (Kurt van Helsing) is being staked through the heart before being laid to rest by his blind brother (Conrad van Helsing). The van Helsing family have a tradition of being vampire hunters and were the downfall of Dracula in Bram Stoker's novel of the same name. Back at the clinic, Vampirella discovers that Dr. Westron is really Ethan Shroud, warlock and leader of the Companions of Chaos, a cult devoted to the mad god Chaos. During a human sacrifice ritual to bring Chaos to Earth, Vampirella destroys the Crimson Chronicles (the "bible" of Chaos) and is instrumental in the destruction of the clinic and all the cultists. Eventually, they do find Vampirella and Adam falls in love with her. Conrad still believes that she is a danger and it is a long time before he puts aside his desire for vengeance and finally accepts her as an ally in his quest to destroy "true" vampires. 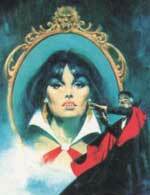 In her travels Vampirella meets an aged, alcoholic magician who's career is failing. She teams up with Pendragon as the assistant in his magic act, providing the grand finale when he makes her disappear - replaced by a bat! The addition of Vampirella to the act boosts his career and they travel all over the world with their magic act, meeting strange and wonderful people who all seem to turn out to be monsters of some sort. In a brief career as a B-movie star, Vampirella meets Pantha - another alien from a planet in the Satyr and Circe star system. Pantha's race also transform, but into large cats. Pantha transforms into a black panther. Aliens, demons, gods, monsters, vampires and werewolves were on the daily agenda for Vampirella, with a variety of sub-plots involving her deepening relationship with Adam van Helsing, Conrad van Helsing's distrust of her, and her need for a daily infusion of a blood substitute serum to hold her blood lust at bay. During the Warren Publishing years Vampirella blossomed from a slightly tacky bit of titillation used to introduce the real horror stories in the early issues, into a strong character in her own right with her own entourage of supporting cast - both heroes and villains. As time passed the focus was less and less on the traditional horror story and more on the Vampirella story, which quickly established itself as the lead story and the cover page subject. Jim Warren had the good sense to recognise real artistic talent and many of the top writers and artists in comic book history were published in Vampirella. There are too many to mention here, but one person who stood out head and shoulders over the rest and who's art defined Vampirella for decades to come was José "Pepe" Gonzalez (see example on the left). After the demise of Warren Publishing in 1983, José Gonzalez dropped out of sight, returning to his birthplace, Barcelona. Fortunately, after 20 years in the void, he was found and has created another Vampirella masterpiece for the cover of Revelations #1.